Big-Vault is proud to announce we now service Portage, Indiana, which happens to be the largest city in Porter County. Portage now has access to state of the art Big-Vault portable storage. There are no limitations as to where in Portage, Indiana we will deliver including downtown Portage. We will deliver it to you when you want it at a location of your choice. 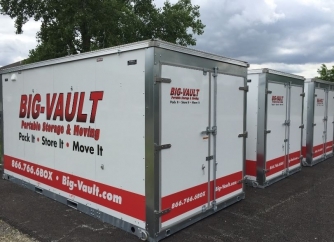 When it's full and ready to be picked-up, and either moved to your new home or stored at our secure storage facility at Castle Storage located on Route 30 in Dyer, Indiana, you just call us at the office and we will send one of our professional drivers over to move the Big-Vault. Big-Vault understands that moving can be a very stressful event in ones life. We do our best to minimize the stress by making the process of moving as stress free as possible. Just give us a call and one of our customer service representatives will be happy to walk you through how the process works and give you a free quote.